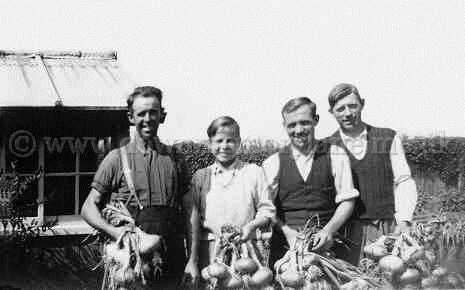 Here we have William Millar with his workmates at a local farm showing of a harvest of onions back in the 1940's. His workmates are unknown. 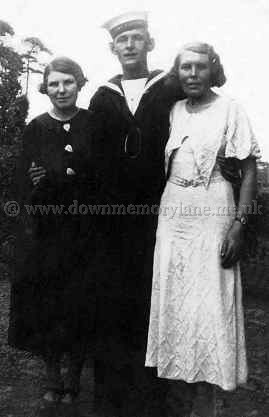 Safe and well and home from the sea in 1940 is Sammy White with his cousin Mary White on the left and on the right is his sister Jean White. Standing outside his shop in lower Main Street is Hugh McManus with his sons in 1902. The family business actually started in 1869 and as you can see they not only supplied materials but were builders as well. Not only did they take on local projects but they worked far and wide, the lighthouse on Aran Island off Co.Donegall was one of their projects. As the business grew they purchased a steam sawmill and were then able to make all their own planks ect for the building trade. The Hurrell family bought over the business in 1945 and are still in business but the building in the photograph was burned down in 1986 but the house on the right is still standing. 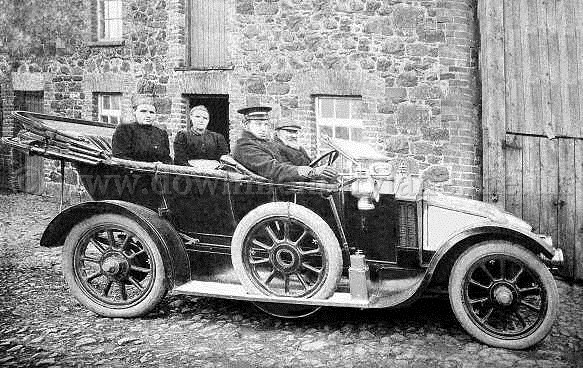 This is Hollybrook Beetling Mill at Magheralane in 1912, about a mile outside Randalstown and getting his photograph taken seated in his Renault tourer beside his chauffeur is the owner Mr. John L. Smith. In the back of the car on the left is Mrs Lindsay with her daughter whose name is unknown. The beetling mill hammered the linen to bring out the finish that linen is famous for. Powered by the water from the River Main the noise from the mill was tremendous that it could be heard quite a distance away. Not only did the workers become deaf with the noise but the building itself vibrated with the pounding that sometimes the mills would become so unstable they would have to be abandoned. 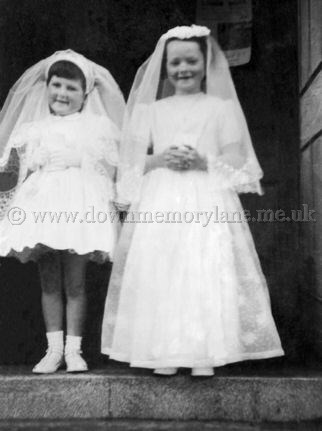 Standing on the steps of St McNissis in Randalstown 1964 having just been confirmed. We have all smiles Moria Kelly and Moreen McNally. 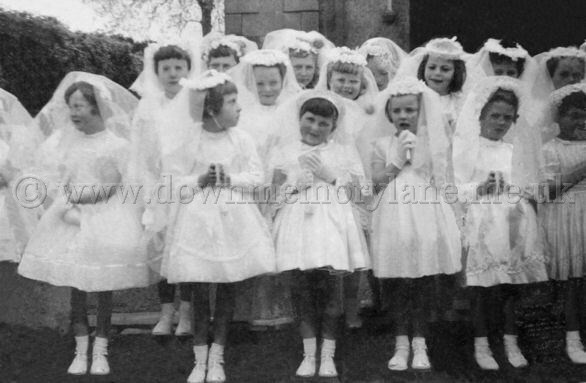 These girls in their lovely dresses for their Confirmation are standing on the steps of St McNissis in Randalstown in 1964. In the centre at the front is Moria Kelly and behind her to the left is Moreen McNally. 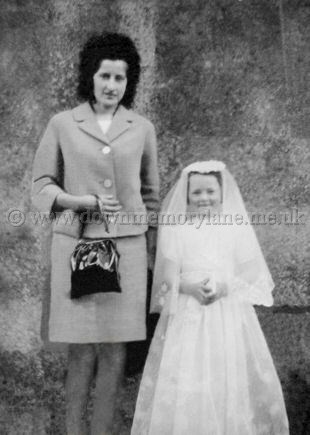 All set for her confirmation in St. McNissis at Randalstown in 1964 is Moreen McNally with her sponsor Philamena McCallen. 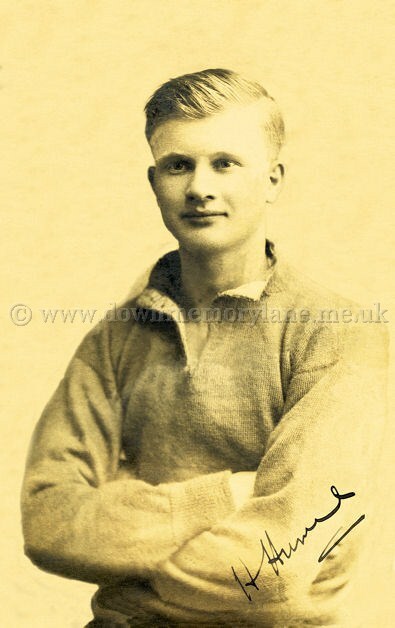 This is Herbie Hume who played for Linfield from 1935 to 1938. He received a bad knee injury which ruined his football career. He returned to play a few matches in the 1939/40 season before he was forced to retire. He was one of 12 children who came from a well known Randalstown family. His brother Jim played on the the famous Willowfield Amateur team who won the Irish Cup in the 1927/28 season. Herbie became an electrician and emigrated to Toronto, Canada in 1955 where he resided until his death in 1988 at the age of 71 years. 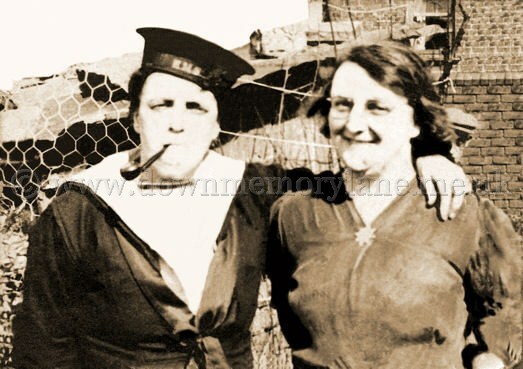 This stern looking sailor with his arm round this lady is none other than Sarah McCaughey with Annie McCaughey who had come over from Blackpool for a holiday. 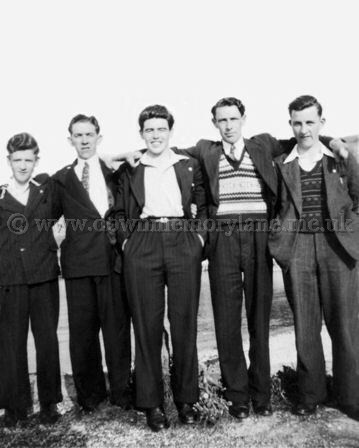 This fine bunch of young men from Randalstown had travelled to the Glens in 1948. The reason was to support their home Hurling team, from the left we have Henry McCollum, Bobbie Heatley, Sean Martin, Sean Letters and Alex McVeigh. 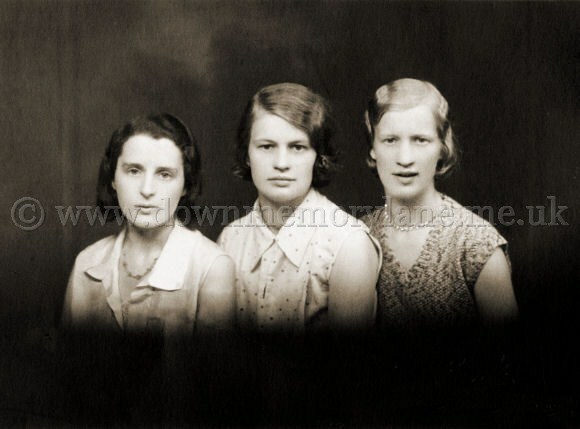 These three Randalstown beauties having their photograph taken in the 1930's at Mack's Studio in Larne. We have from the left Katie McCartney, Tillie Hume and Rebecca Hume. 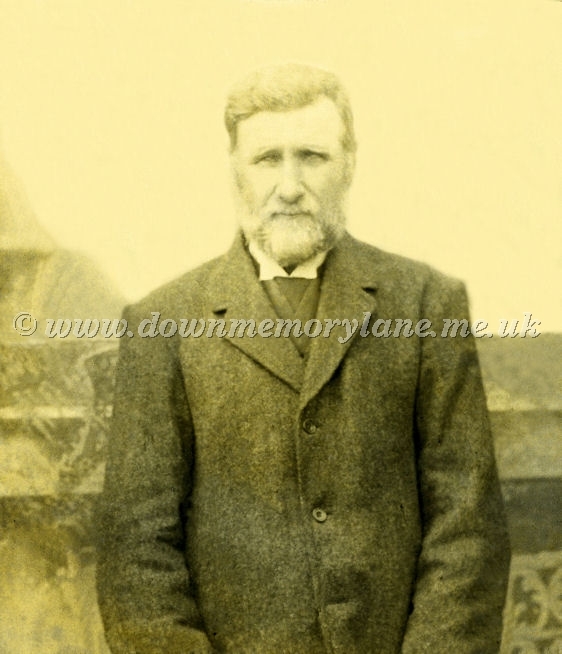 This is John Harper back in April 1922, his family were small farmers off the Magherlane Road, Randalstown. His father Thomas Harper was the exception he was a blacksmith and cycled to Belfast on a Monday morning and returned on the Friday night. Now that was some cycle for bikes back then were built to last and weighed a ton, not like the bikes of today. 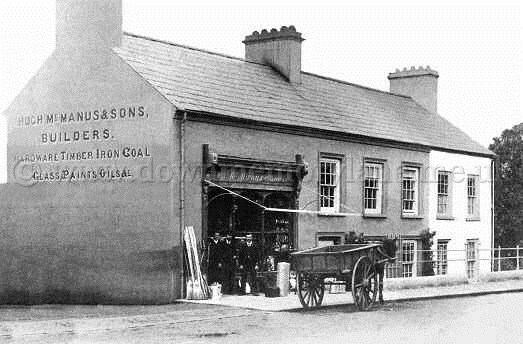 Later in life he opened a garage that was at the then entrance gate of the Fair Hill market in Ballymena and then moved to the Cushendall Road. 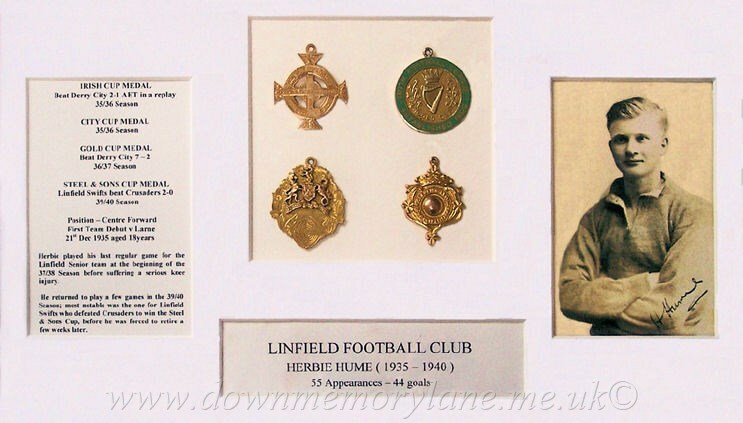 Here we have his medals and his time at Linfield Football Club.